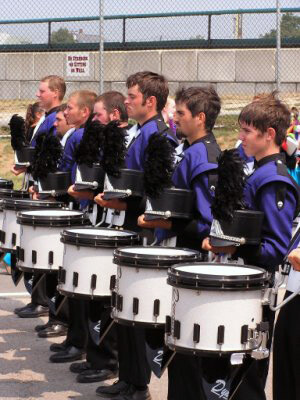 Here's a shot taken by Andy Johnson of Collierville, Tenn.
"This picture is of the 2005 Memphis Sound snare line before our last walk as a drum line back to the busses after our finals performance. "From far to near is: Brian "Stackalicious" Stackhouse, Matt "Mama" Mothersbaugh, Matt Bishop, Matt Howell, Matt Hines, Pete Boissonneau, Alex Cantu, and Drew Guy. "That's right, four Matts in one snareline." Thanks Matt for the submission!